[Beer tents at the San Juan Brewfest in downtown Durango. Photo: http://sanjuanbrewfest.com] Every year just before the Labor Day weekend, Downtown Durango holds their San Juan Brewfest, which is one of the biggest and grandest beer tasting festivals in the southwest. Aside from all the music, beers, food, and all pleasure, the festival is also a charity event that benefits the United Way of Southwest, Colorado. The annual brewfest event will have 51 breweries and over 100 beers to sample on. In addition, live music will be provided at the event to make the experience more unforgettable. 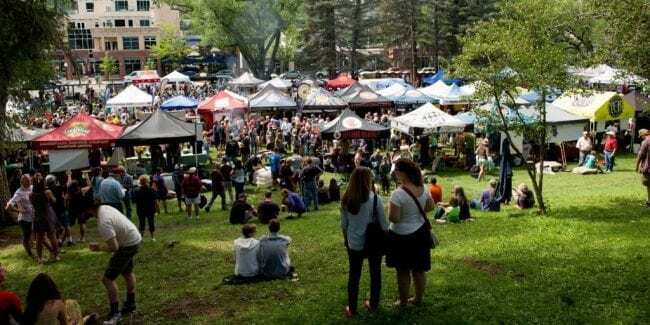 The 21st annual San Juan Brewfest will be held on August 24th, 2019 at the Buckley Park in Downtown Durango. This adult-only festival is nice way to celebrate the summer. Mingle around fellow attendees as you sample on beers while enjoying good music. There are also booths and vendors all over the area that sell food and other items.